I did this lesson in the arena, but the theme was outdoor trail. 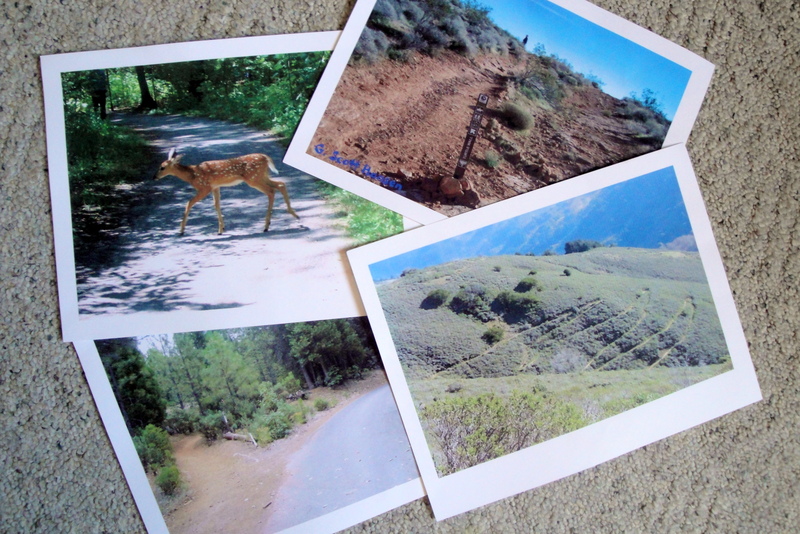 Preparation – find pictures of the following obstacles one might encounter on an outdoor trail ride and print them on thick cardstock. I used Google Images to find them. Also for preparation make sure your horses are desensitized to the props below. 5 vertical poles (either with a solid base or sticking up out of a cone), each with a picture of the outdoor obstacle masking taped to it. (Below the poles are marked 1-5 so you can see the pattern). Intro – explain that today we are learning about outdoor trail riding! 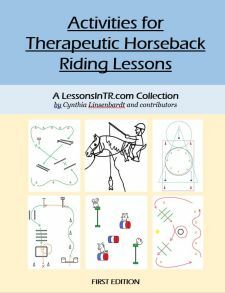 Warm Up – walking on the rail and steering circles as you teach and practice some trail riding rules (such as those listed on the Trail Class Obstacles and Pattern page under “Outdoor Trail”). Common Trail Obstacles – explain that now we’re going to meet some common obstacles you might find out on the trail, and how to handle them. The first round have everyone together stop at each pole, figure out what obstacle the picture is of, explain/show them how to handle it, and then they try it. For Pole 1 “Animals” they calm their horse down by talking to it and steering little circles. For Pole 2 “A Road” they halt, listen, look both ways, then cross when it’s safe. For Pole 3 “New Objects” they stop, let their horse see and smell it, walk in small circles, and can let a calmer horse go first. For Pole 4 “Up Hill” they do two point for a wall, and even can do a tack check. For Pole 5 “Down Hill” they learn what switchbacks are and weave the zig zag cones. To bring them back to the beginning of the pattern have everyone go “Up Hill” one more time. Next send them through the pattern on their own, one after the other, for 3 attempts. Reminders, praise, and correction is given as needed from the instructor and volunteers. Have students switch who is “leader”. Progression has many possibilities! Progress to trotting “Up Hill” in 2 point; to taking away cones for switchbacks down a hill that has no trail; to having the leader 3 feet away, then spotting, then not there at all; switch the pattern order; etc. Cool Down – walking. 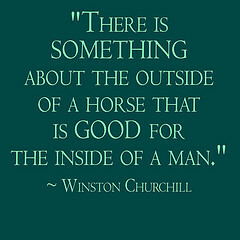 Explain for the “walk home” we always walk our horses and never run. Teach them how to walk on a loose rein or “on the buckle”; how to check their horse is cooled down enough by watching its nostrils and feeling how damp its chest is. Demonstrate woah, walk on, and steering with correct hand position 100% of the time, no leader, no prompts. 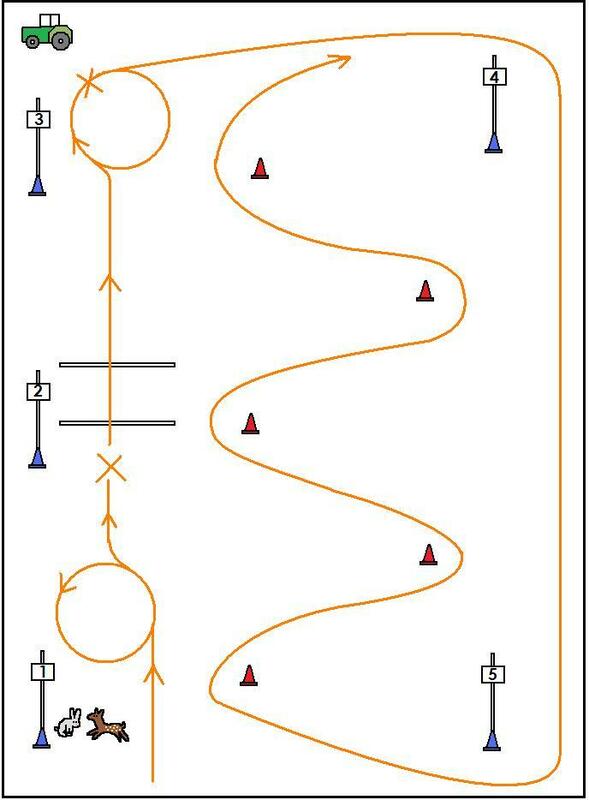 Perform a 5 step obstacle course 3/3 times, with the leader 3 ft away, no prompts. Demonstrate 2 point trotting with correct posture for 3/3 walls, with leader and ankle hold. Have fun with it! You can change any of these outdoor trail obstacle to one of your choice. I would have loved to bring in a huge log for them to walk over, or a branch to duck under!